Help people to increase their awareness in and of the world. Help create a positive global impact attentiveness of who and what they surround themselves with. Ridding the negative to create the lives they always dreamed of. Balance, Strength, Flexibility, Breath, Visualization, Mental training. To help achieve their health goals. Use a Holistic approach to training the body and mind to achieve greatness. With work, family, body and life the way only an intuitive yoga teachers teacher and seasoned MOM can!" Receive emails about new products, deals and training tips! Subscribe and receive Gwen's Goal Setting Guide for free! 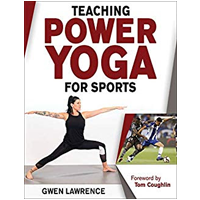 Gwen's latest book Teaching Power Yoga for Sports is now on sale at Amazon! Take your Power Yoga for Sports™ practice anywhere on your mobile device! For iPhone and Android.